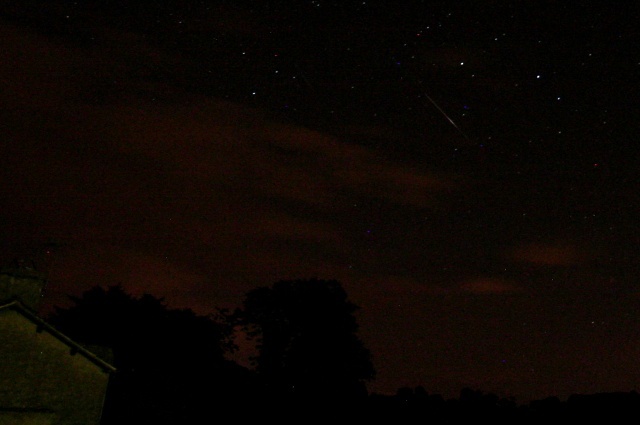 The BBC was trying to do an article covering the Perseid meteor shower. Well they did a largely fair job on it, well almost. No special equipment is required to watch the shower, which occurs when Earth passes through a stream of dusty debris from the comet Swift-Tuttle. The meteors appear to come from a point called a "radiant" in the constellation of Perseus - hence the name Perseid. One person won't actually see 100 per hour, maybe three or four people looking at different parts of the sky might see closer to that sort of number. But this year, light from the last quarter Moon will interfere significantly with the view. Astronomers say binoculars might help with viewing the spectacle, but will also restrict the view to a small part of the sky. No sane astronomer would ever say that, you'll never see any meteors through binoculars. Don't bother even bringing binoculars with you, unless you plan to have a look at the Moon (best to do once you go outside so it doesn't ruin your dark adaption), or some of the open clusters in the region. The Perseid meteor peaks tonight (evening of the 12th, morning of the 13th of August). This year is favourable, like 2005 there is no Moon to wash out the sky. Observers will need to look in an easterly direction, the radiant is within the constellation of Perseus. However it's best to view as much of the sky as possible rather than focus on the small area around Perseus. If you stay out for an hour or two you should see perhaps a dozen or two meteors under good conditions. Some tips for beginners; take a deck chair out there so you can lie down and look at the sky, get away from as many lights as possible to avoid destroying any dark adaptation. You may also want to bring some drink and or food if you get hungry, and bring something to keep you warm as under clear skies it can get quite chilly. Well spotted loads of Perseids this year, pretty clear, no Moon, too much light pollution (town of 36000 people) but averaging 40 per hour. This is based on observations between 11:30 (BST) 00:50 with two sets of eyes looking east. Spotted a very weird object, dark-orangy colour about -1 mag appeared in Cassiopeia and travelled through Pegasus all the way to the horizon in about 5-8 seconds. The distance it travelled instantly pops into my mind as a satellite, but doing it that fast and at around 00:30 when I very much doubt the Sun is illuminating any objects in that low of an orbit. Persieds are typically green in colour, the ones I saw lasting say 10° at the most and leaving trails. So not sure exactly what it is. Also think I saw a tumbling satellite, was blinking on and off every few seconds, this was around 11:50 traveling south to north. I also believe I saw M31 the Andromeda galaxy, which is the first time I've seen it with just my eyes - although just barely with light pollution making it a hmm am I seeing it or not moment. Not bad going for my eyes to see 2.2 - 2.9 million light years with all this light being sent up into the sky. Just think, even though it's that far away it's about 12 times the size of a full moon in the sky. You can actually see it in the above photo too - it's the star with a slight smudge around it near to where the meteor begins.